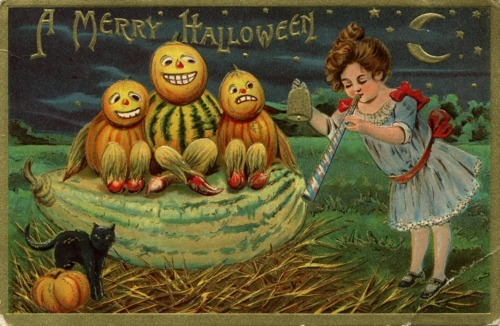 Embossed Hallowe'en postcard depicting a trio of pumpkin figures with jack-o'-lantern heads, gourd bodies, and husk arms and legs, seated atop a large oblong squash. A girl rings a bell and blows a party horn to the side. Elaborate color postcards were popular during the early 20th century. This manufacturer of this example is unknown. Delaware, Oklahoma postal cancellation on reverse, with handwritten message to Miss Iva Capps of Buffalo, Kansas, from her Aunt Anna.